Is Apocalypse About to Break Into Song in This Sneak Peek at Degeneration Pt 2 From X-Men Black Mojo? Home » Comics » Is Apocalypse About to Break Into Song in This Sneak Peek at Degeneration Pt 2 From X-Men Black Mojo? It’s X-Men Monday, but Marvel Editor Jordan White, perhaps still reeling from last week’s stunning Cyclops shocker, or maybe just exhausted after New York Comic Con, hasn’t given us any X-book previews yet. 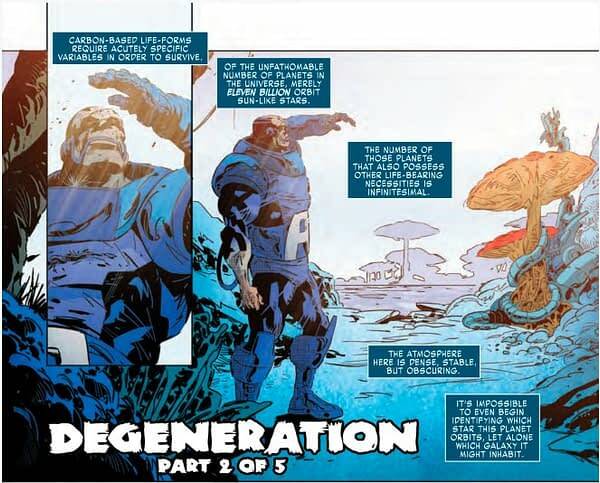 Enter Zac Thompson, who took to Twitter to celebrate the internationally renonwned holiday by posting a brief preview of the second part of Degeneration, the Apocalypse backup story running through each of the X-Men Black one-shots. When we left A-Pac last issue, he had inadvertantly found himself transported off-world after lending his regenerative powers to a clone body he was working on, resulting in a real bummer: he’s becoming human. It looks like Apocalypse is letting life get him down. Can we guess what happens in the rest of the chapter? Degeneration Part 2 is part of X-Men Black: Mojo #1, in stores Wednesday (see a preview here).